I'm pretty certain that this is the simplest and easiest Chicken Corden Bleu recipe in the world. Traditionaly, it is not an easy dish to master but not no longer! Further more this recipe is truly scrumptious, thats why it made it into the 'best recipes' section on this website. Just a little bit of advice, try and find the biggest chicken breasts you can find, this will make your life alot easier. If you have any variations of this dish or any other Chicken Corden Bleu recipes that you would like to share with us then please feel free to let us know. Just follow the directions on this page. Rub on a small amount of salt and pepper and then put one slice of ham on top and one slice on ham on the bottom. Spread a thin layer of garlic onto the top of the ham and then add a slice of cheese. Roll the whole thing up and the secure it with a cocktail stick. 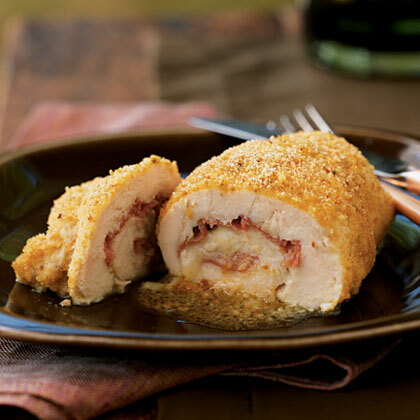 Spread another thin layer of garlic butter over the top of the rolled up chicken breast and then rub on the breadcrumbs. Put the four chicken breast into a lightly gresed baking tin and bake in a pre-heated oven at 180 c for 30 minutes. Congratulations on making this easy chicken coden bleu. I hop you enjoy it, it certainly beats shop bough ones anyway!